In this example we will show you how to link to dynamic page and set the Watch List Parameters on the target page. For demo purposes, We will have Device1 and Device2 as demo data. Note: If you Drag & Drop the ma-watch-list-parameters, please, make sure that you add ng-change="updateParams = designer.parameters" so that the query parameters are updated when the watch list parameters are changed. Create and edit the Menu item to add a parameter at the end of the URL path. This parameter needs to match the same variable being used in the Watch List parameter name. In the example below we've added ?dn to the URL path. 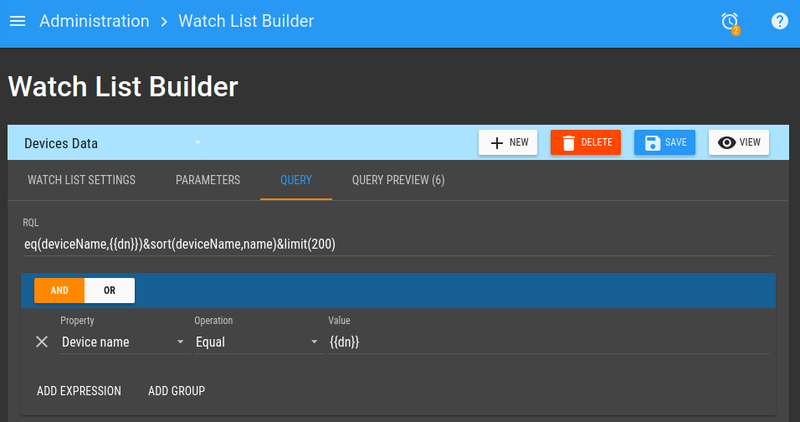 dn is the same name used in the Parameter on the watch list query. Note: this will not work with "Data source" or "Point hierarchy" type parameters. Please consider using a "Data point tag" parameter instead.